I love my food. More to the point, I love good food made from fresh ingredients thrown together with a dash of Mediterranean flair. I love food prepared with care and passion. I love a dish loaded with vibrant flavours and even more vibrant colours. Little wonder my first year in Greece was marked by an extra ten kilos, in part thanks to kindly new friends and their little (and not so little) plates of hospitality. So, what problem could I possibly have with Greek food, where what’s presented on the plate is the ultimate expression of a mother’s love and devotion and every conceivable occasion is marked with something edible (usually in far larger amounts than necessary)? Well, apart from the unavoidable arguments with the bathroom scales had by many who relocate their pallid northern European hides to Greece, there are some things that might cause the most enthusiastic or adventurous visiting diner to put their fork down. After a quarter of a century here, there’s not much I won’t eat. …there are some which still make me suppress an inner shudder and turn away from the table. I have tried some, in the spirit of trying everything once, and there have been times when it has been a lesson hard learned, but it always seems to provide ample entertainment for those around me. A skewer of goat offal (sweetbreads, hearts, lungs, kidneys) wrapped in intestines before being grilled over an open flame. Beyond the “eeuw” factor of the origin of the meat involved, it’s a dish with a particularly pungent, even overpowering flavour. Unfortunately for some (that would be me), to the casual observer (me again) it can look rather like the more innocuous ‘kondosouvli’ (large bite-size morsels of ‘acceptable’ cuts of pork, deliciously seasoned and cooked on the skewer). I’d only been in Greek for about a year when I found out the difference between the two. I was at a party thrown by old friends of my boyfriend (now The Mr), where there was a positive cornuccopia of grilled meats on offer. Recognising what I thought was kondosouvli I enthusiastically grabbed a skewer and took a large bite under the amused eye of my Beloved. He must has known what was coming, and he couldn’t help laughing out loud as my taste buds registered the offal taste in my mouth, my eyes widened to the size of dinner plates in shock and surprise, and my face flushed fifty shades of green. There was nowhere, and no way, I could spit it out (it was the first time I’d met his friends, after all), so I had to take a deep breath and bravely swallow the massive morsel. I soon learned to tell the difference. I always thought I enjoyed seafood. I love a nice seared scallop, a scrumptious paella, comforting fish soup, or a good Coquilles St Jacques. But I soon realised that it had been a mistake to let my future mother-in-law know. She called me one Sunday and invited me for ‘a special treat’. The Beloved claimed ignorance when I questioned him, but assured me his mum was a great cook (she is). I was therefore ill-prepared when she proudly placed a large platter of seashells on the table before me. They were certainly super fresh, I could still smell the sea on them. And a squeeze of lemon produced further proof as it prompted a squirming of tongue-like things protruding from the shells as they lightly shifted and clattered on the plate. Ma-in-law grabbed one and held it out to me to show me how good it was, squeezed a little extra lemon juice on it, then sucked it out and swallowed with a smack of satisfaction as it slipped down her gullet. I don’t subscribe to the “I don’t eat anything with a face” school, but I do draw the line when the meal is moving around the plate on its own. Luckily, the Beloved feels the same way (much to his mother’s disgust), and he managed to recover from his giggles at my expense long enough to offer me a plate of (cooked) prawns. I know they’re a staple of Mediterranean cuisine. I know they’re good for you and awfully versatile. But just no. Something about them. Heavy, slimy, seedy, just does not agree with me. Unfortunately, since becoming a pescatarian a decade ago (I eat fish and seafood, but no meat), aubergines have made a regular appearance on the tables of well-meaning hostesses wishing to cater for my dietary eccentricity. The look on their face when I confess to not liking aubergines is akin that of a child shown a puppy on Christmas morning, then told it’s not their present. A soup made from lamb offal, traditionally served after midnight on Easter Saturday once the priests at the local church have declared “Christos Anesti!” (Christ has risen). Everyone traipses home with their lambades (Easter candles lit with the Holy Flame to mark the resurrection) to a plate of margeiritsa and red-dyed boiled eggs to break the 40-day Lenten fast. Meat-loving Greeks are hungry for the treat as Lent traditionally means giving up more than chocolate or coffee or whatever, as it does in the UK, but total abstainance from meat, eggs and dairy products. That does not prevent the ladies of the house spending most of the day preparing the ingredients for the soup, including meticulous cleaning and chopping of assorted innards before cooking them with wild greens in an egg and lemon sauce. It’s a lumpy concoction loved by many but too heavy for my taste for post-midnight feasting. I had initially been prepared to try it – until I walked in on my mother-in-law up to her elbows in a bowl of intestines which she washed thoroughly, before turning them inside out with a knitting needle, then washing them even more thoroughly. I ate a lot of boiled eggs that Easter. Like aubergines, there’s something about their sliminess that just doesn’t do it for me. Sorry. I got over the delicate English revulsion at seeing the WHOLE animal on the spit – complete with head, bulging eyes, lolling tongue and (shudder) teeth – relatively quickly, rationalizing that if you’re going to eat meat it’s more honest to use and eat the whole thing. However, no matter of rationalization could ever tempt me to tuck into the supposed joys of munching on the tender cheeks and sucking on the eyeballs. Ditto. And there’s something very creepy about fish teeth grinning up at you from the platter. Overboiled starchy rice, served in its own gloopy, glutinous liquid with a squeeze of lemon. It was first served up to me once day as I recovered from a particularly nasty tummy bug, with assurances that it would settle my stomach like a charm. One look at its frankly frogspawn-like surface and the tiniest taste from a spoon (in my weakened state, it vaguely reminded me of soap flakes) made we prefer to suffer in silence than endure the cure. There are so many wonderful fresh, delicious vegetables available in season in Greece, so why do so many insist on boiling them into submission? There’s nothing worse (or smelly) than soft, soggy cauliflower or broccoli. I like my veg with a bit of bite and resistance, not the consistency of day-old custard. And a limp green bean is about as enticing as something else in its flaccid state. This Greek tripe soup smells awful in the cooking but its fans claim it’s delicious and has almost magical restorative properties after a late night out. 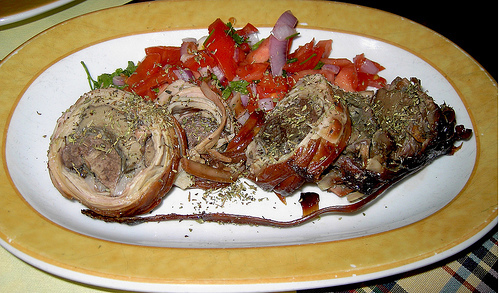 It’s famous in Athens as THE food to have after a night of heavy drinking at one of the city’s bouzouki joints. And when we say late night, we actually mean very early morning, as Greece’s nightlife hot spots rarely close before 4am – and there are plenty of specialist shops serving patsas after hours along Syngrou Avenue. I’ll be honest, I’ve never tried it. But until they can find a way to eliminate the stench as it’s cooking, I’m pretty sure I never will! But don’t let my list put you off. You will never go hungry at a dinner table filled by a house-proud Greek noikokyra. Gorgeous fish (so different to the fish fingers or the frozen square lumps of fillet in boil-in-the-bag plastic of my British youth in the 1970s and ‘80s); succulent tomatoes, cucumbers, peppers, olives, bursting with flavour; salty, earthy cheese offset with a sprinkle of oregano or basil; and garlic, lots of lovely, pungent, smelly garlic. And if all else fails, there’s always the local souvlaki shop where you can still get a cheap and tasty pitta stuffed with grilled pork or chicken with salad and tzatziki. Words have been Mandi Millen’s friends since she was a child growing up in a house filled with books and story-tellers in Surrey, UK. She started telling her own stories young, and she’s still at it – for her own pleasure, to amuse others and (occasionally) to exorcise her demons. After leaving school, she became a reporter with weekly and daily newspapers in the south-east of England, and later went into press & public relations. Everything changed in 1989 when she left her job, her home and the UK for a six-month working holiday in Greece. That was the plan – until a brown-eyed boy in Samos persuaded her to stay. Today, he is her husband and father to their 18-year-old son. Great postings Ladies! Some day you’ll need to visit the U.S.
Hope one day not too far away Cheryl! Sending you lots of love!